As we face the reality of global climate change and the destruction of our natural ecosystems, the topic of sustainability has become increasingly pressing, and present. While sustainability encompasses many things, we believe that it relies on our willingness to be dirty. BIOME DIRTY calls attention to our obsession with cleanliness. The jacket’s deterioration in overly clean environments exposes the incongruence of our modern human lifestyle with the ways in which nature achieves sustainability. BIOME DIRTY specifically highlights our preoccupation with antibacterial environments as this compulsion is detrimental not only to the natural world, but to our bodies as well. The 3D printed structure of the jacket houses fungus spores that are contained through a symbiotic relationship with the wearer’s microbiome and their exposure to surrounding environments. In research done on human microbiomes, it has been found that less bacterial diversity leads to more fungal growth (Lynch, 2014). Wearer’s exposed to overly clean (i.e. less bacterially diverse) environments, with similarly unhealthy microbiomes, allow the spores of the fungus to germinate, push out of the structure, and begin to deteriorate the jacket. Ultimately, the clean geometry of the initial form is overtaken by the organic growth of the fungus. For wearer’s with bacterially diverse surroundings and microbiomes, the fungal spores within the structure of the jacket are contained, allowing the jacket to maintain its clean, geometric form. 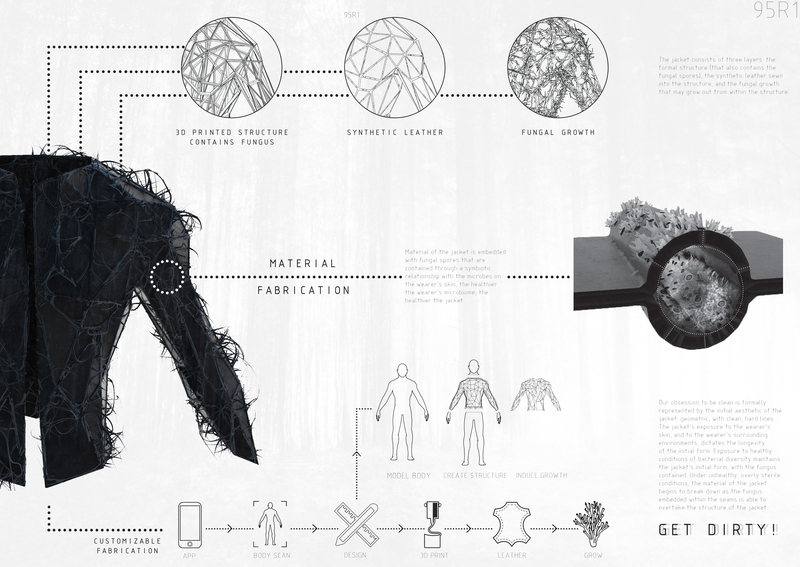 Initial costs would include an application development, as the customization of the jacket relies on a body scanning app that creates the geometry for the structure to be modelled around. This gives the jacket an aspect of generative design. It also means that the ability to develop the jacket exists within maker spaces with 3D printers or robot arms that can build out the structure. Synthetic leathers are becoming increasingly available, and the leather of the jacket would be grown around the 3D printed structure, giving each jacket made a form unique to the wearer. The fungal spores would be harvested, and bred to be implanted into the structure of the jacket. All of the materials used are sustainable and biodegradable. The organic nature of the jacket means that when the fungal growth overtakes the structure of the jacket on wearers in unhealthy environments, the jacket will be fully biodegradable, giving diversity back to the environment, or returning to the environment that which the wearer has taken away. 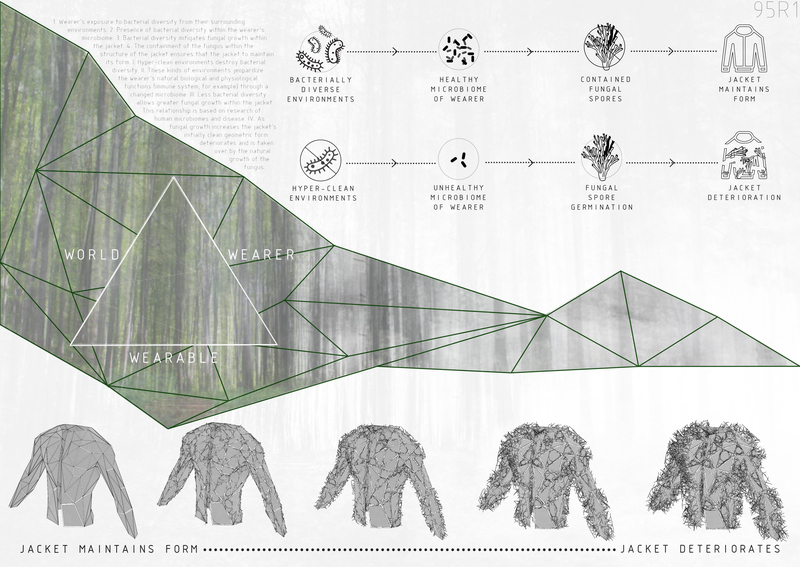 This aspect of the jacket continues the cycle of the wearer, the wearable, and the world, as the jacket becomes reintegrated into the environment as organic material. 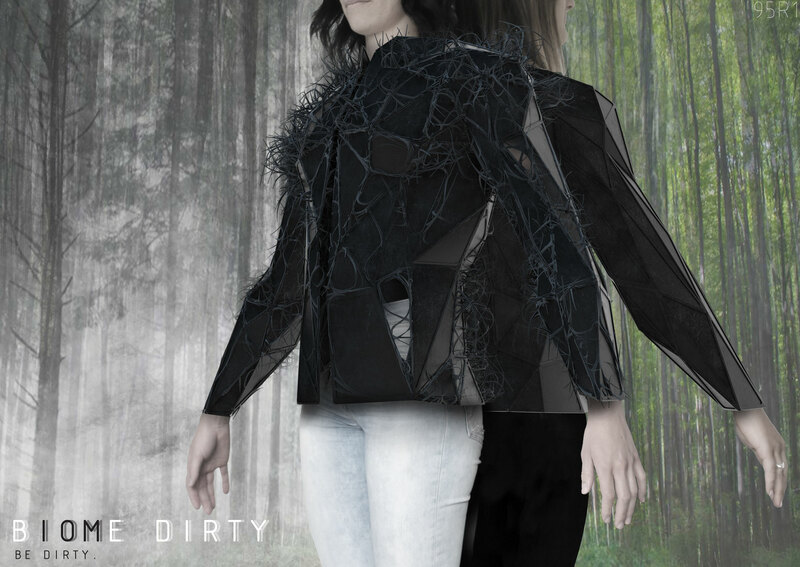 BIOME DIRTY therefore functions as a feedback device for the wearer around a larger issue: communicating the health of their own bodies and their surrounding environments. Can our wearables offer more to us and to the environment? We believe that such essential aspects of our daily lives has the potential to be more than simply worn, but to be communicative, and to be in relationship with us, and with our surroundings.